Anyone that has followed my rocketry stuff for awhile knows I like H2O2. Both Beal and the British Black Arrow group did some really cool stuff with H2O2. is what I have been running for the past few years. 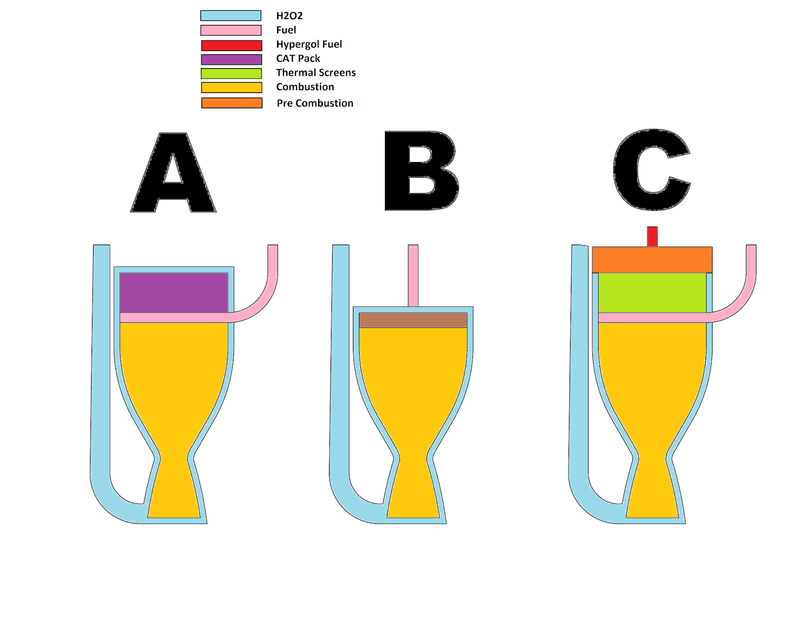 H2O2 comes in cools the engine, goes through a CAT pack and then ignites the fuel injected below the cat pack. 1)CAT pack limits the H2O2 concentration to about 85%. 2)The CAT pack has a lot of pressure drop. 3)Cat Packs wear out or get contaminated. B normal chamber with hypergol (or not)fuel. I've been given some evidence of an available decent performance hypergol for H2O2. 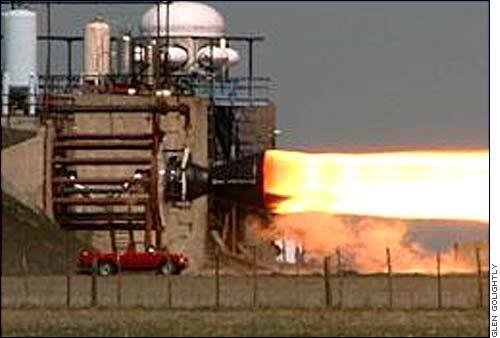 Its basically a traditional regen rocket motor. It needs a traditional injector, so not sure if I'll build a pintile(My fireing) , or a shower head (my fireing)` I've build and fired both with Lox Alcohol before I switched to H2O2. This allows one to run to 100% H2O2 and to reduce the pressure drop. The primary drawback is the fuel in small quantities from a chemical supplier is about $425 a liter. The O:F is 4.9 so the fuel for a full Class 2 burn is about $1300 For a full Class 3 burn that is 27K, its starting to hurt.... The H2O2 for the same class 3 burn is $4500 so not totally out of the ballpark.. There has been an experiment that I've wanted to run for a very long time. I've wanted to try and run a wet, no catpack H2O2 engine. I've always wondered how to get it lit. I think that at some point In testing I'll set up to use the Expensive Hypergol to light the motor, much like TEA/TEB is used in Lox RP engines and see if it continues to run well once the hypergol slug is gone. Before thinking about the hypergol I'd planned to run this test with a silver cat pack and 100% peroxide, the silver cat pack would quickly melt and die, but probably not before getting the inconel screens hot enough to do thermal decomposition.... It seems the screens to do decomposition must get to and maintain at least 600C. The big drawback to all the thermal decomposition schemes is that hot H2O2 vapor can detonate if it does not decompose. One of the primary goals for Unreasonable Rocket , from the very beginning is to excite people to try and do cool rocketry things themselves. It does not take NASA levels of $$. I'm pretty much doing this project by myself in my Garage and at FAR. Last time I did this my Son was helping me, now I'm doing it solo. So using this as a portal to interact with people and maybe inspire people to help with the project is part of the blogging. *Comments on H2O2 aka hydrogen peroxide. The hydrogen peroxide that sits in your medicine cabinet and that you put on your cuts is 3 to 5%. Meaning its 5% H2O2 and 95% water, The H2O2 were talking about here is at least 85%. This high strength peroxide decomposes exo-thermally to steam and hot oxygen. Any concentration above 72% has enough energy to full vaporize the water content and is thus a hazard as it can make lots of hot gas quickly. This decomposition needs some thing to induce it, heat, or a catalyst chemical. With 85% you can run it through a silver catalyst (CAT Pack) for a very long time. At 90% long term use will melt /degrade silver. Above 90% Silver does not last very long at all as the decomposing H2O2 melts it away, 98,99 or 100% has a more energy and higher performance as a rocket oxidizer. If the engine is running and you inject more raw peroxide, will you quench it? I've always wondered if it is possible to use a cat pack and then a bypass valve to keep it running. I've been involved with a "Wet" hybrid peroxide motor and it ran fine. And there used to be a website here. Maybe it's archived somewhere else. My propellant of choice when I want hypergolic ignition is morpholine as fuel and H2O2 as oxidizer. I buy morpholine from a lab chemical supplier and pay €15/liter and get it delivered in 10L PE-containers. I use this combination without a catpack or ignition source (wet hypergolic bi-prop). However, this combination is prone to cause hard starts. To avoid a hard start, I used to dope the morpholine with a soluble catalyst, but now I just start the motors fuel rich and it works great.